Of the 109 English UK centres that reported data for both Q4 2017 and Q4 2018, there was a 2.8 per cent decrease in overall student weeks to 128,257. Adult student weeks decreased by 3.5 per cent, while junior student weeks increased by 13.9 per cent. The last quarter of the year is traditionally dominated by adult students, and they commanded 95 per cent of student weeks in the survey. The authors of the 2018 Q4 QUIC report said that Q4 generally exhibits a lower share of agent bookings than other quarters, but said that 74 per cent of student weeks in Q4 2018 were attributable to commissionable sources (i.e. agents and tour operators), an increase compared with 69 per cent in Q4 2017. Saudi Arabia was by far the largest source market in the last three months of 2018, with an increase of 4,782 weeks compared with Q4 2017, the largest growth of any source market, English UK said. Saudi Arabia accounted for 13.8 per cent of all weeks in Q4 2018. 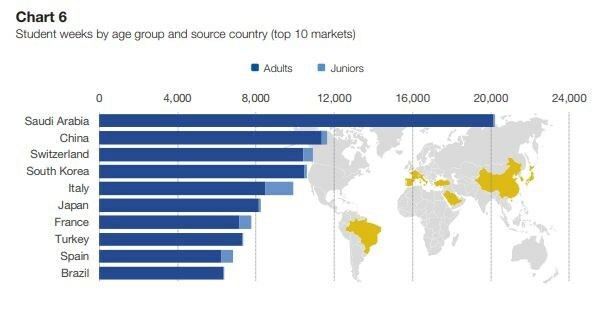 China was the second largest source country with almost 12,000 student weeks, a slight decline, while Switzerland leapfrogged Korea into third place due to growth in junior business. 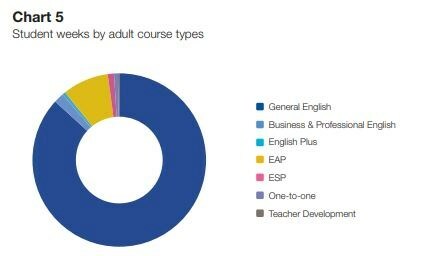 Courses for adult students in the Q4 QUIC survey. General English programmes accounted for 88 per cent of adult student weeks, followed by English for Academic Purposes (8.6 per cent), both relatively unchanged ratios compared with the last three months of the previous year. After growth in the first two quarters of 2018, participants in the QUIC scheme have experienced a decrease for two quarters in a row, with the latest report following a 3.9 per cent decline in weeks in the July-to-September peak period. The QUIC scheme, administered by Bonard (previously StudentMarketing) was launched by English UK in 2017 to provide more timely and in-depth data intelligence for members. The current sample of 136 members represents around one third of English UK’s membership. An Executive Summary of the Q4 2018 data is available on the English UK website. As previously announced, English UK recently unveiled a refreshed logo.